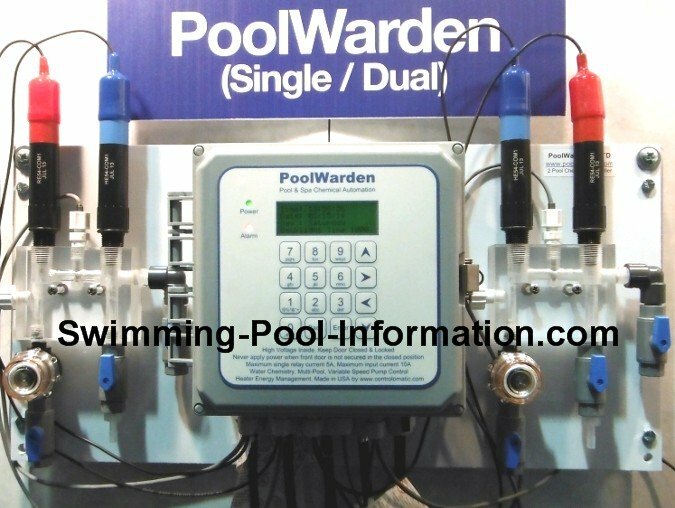 2)The Pool Warden can also control a heater and multi-speed pump,so say the spa in mainly used on weekends or at night the heater can be turned down during off times to save gas,chemicals,and the pump turned down to save electricity. 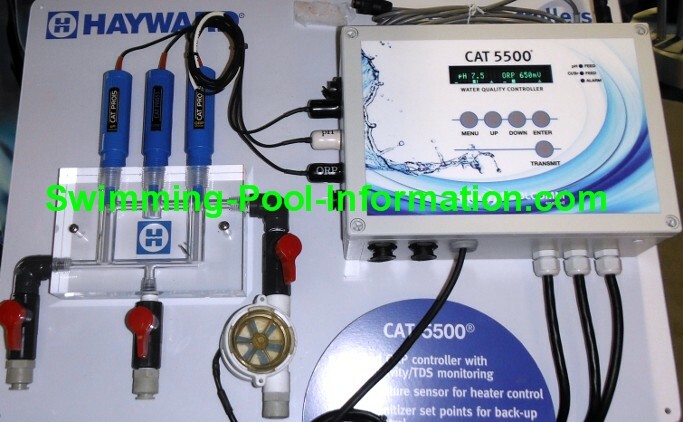 The image above is the Hayward HCC2000 for automation of swimming pool chemicals.These are usually used in commercial pools and sometimes required by the health dept on pools and spas with high usage rates or where chemical levels cannot be maintained manually,but will also work on any residential pool. 2)The ORP is the Oxygen Reduction Potential or amount of oxidizer that can still available from chemicals like chlorine,bromine,or hydrogen peroxide. Below the digital display are two pumps that allow for chemical automation by turning on whenever the levels drop below preset levels. They work by roller balls which squeeze a tube pushing the chemical therefore no pump parts ever touch the chemicals being used. To the left are the three sensors: ORP,PH,and a flow sensor. The black tubes below are inlet and outlet water from the pool and a third tube for taking a water sample for back up testing and/or to calibrate PH and ORP sensors. 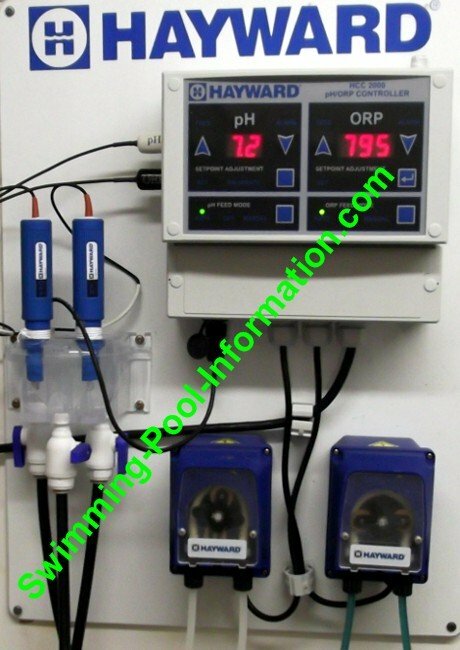 These chemical automation devices feed chemicals directly into the pool plumbing downstream from all pool equipment. These devices can also be connected to the web directly or wirelessly to send alarms to a computer or smartphone when there is a problem. There are many custom programmable features such as amount of time pump will continue pumping chemicals before it shuts off,PH or ORP priority,high and low chemical alarms,and more. 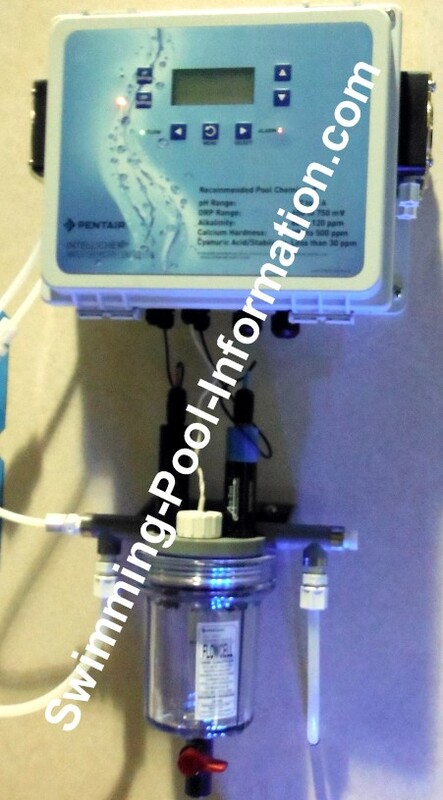 If you already have a Pentair control system the photo above shows the Itellichem system.Below the manufacturers link is another link to purchase these units.